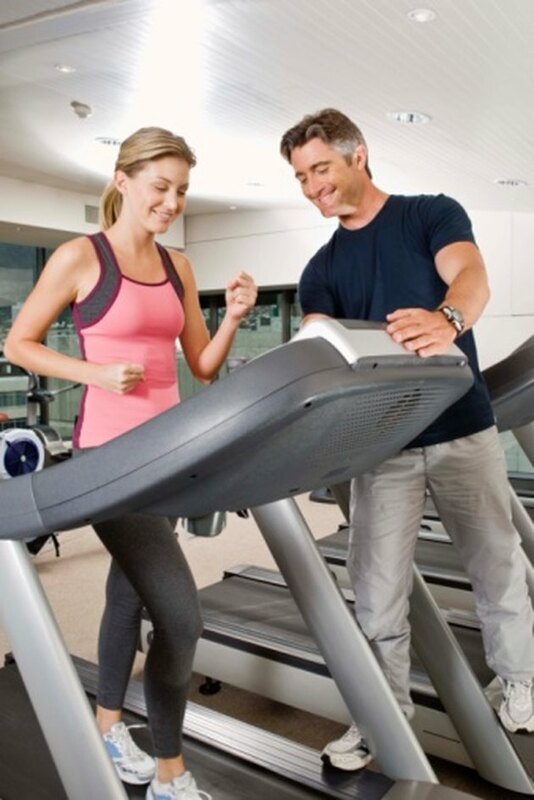 Walking on a treadmill can be a good exercise to complement your weight loss program, provided that you work out for a long enough duration and at a high enough intensity to burn calories. Start walking a little each day, building your strength and fitness level, and you will be on your way to a slimmer you. The intensity of your exercise has a direct impact on the amount of calories you burn, as well as the benefits you reap from walking. In general, you should aim to do your aerobic workout at a moderate intensity to lose weight, which means walking briskly or at about 3 to 4 mph. In a moderate-intensity workout, your breathing will quicken but not leave you gasping, and you should be able to carry on a conversation. You should also begin to sweat about 10 minutes into the workout. You may have to adjust your walking speed up or down to reach this intensity level. Healthy adults need at least 150 minutes of moderate-intensity cardio each week, but you will most likely need to do more to lose weight, especially if walking is all that you are doing. In 30 minutes of walking on the treadmill, you could burn about 150 calories. If you do this every day, without cutting calories or performing other exercises, it will take you about three weeks to lose a pound. To lose more, you will need to either walk faster, longer or add some inclines to your treadmill routine to increase its intensity. If a 30-minute workout seems too time-consuming, consider breaking it up into smaller increments throughout the day. You can walk for ten minutes at a time and still receive the benefits of your exercise. Switch up the speed or incline on your treadmill to keep challenging your body, assuming you are in good enough shape to do so. If you find it difficult to become motivated, put the treadmill in front of the TV, and walk while watching. You can even set an alarm during your shows to remind you to get up and move. While walking can help you lose weight, it is important to watch your diet, too. No amount of walking on the treadmill will get rid of that body fat if you are eating more than you burn off. Consider consulting with a dietitian to design a meal plan with your workout routine in mind. You may also want to add some weight-lifting to your exercise routine, which will build muscle, as well as increase your stamina for walking and other activities.